Kitelife last reported on Bob Moore’s World Record Altitude attempt in our November/December issue, and we’re happy to report he’s still on track and working toward his scheduled attempt. I live in Sydney, Australia and have been flying kites intermittently for over 40 years. In the last four years I have had the more time and money to pursue my hobby which is high altitude kite flying. I am planning an attempt on the world altitude record for a single kite on one line. The current record is held by Richard Synergy who flew to 13,609 ft above ground level in Ontario, Canada in year 2000. My target is 18,000 ft but I will be happy with 15,000. It has been ratified by the Guinness Book Of Records. For the last 2 years I have been testing various designs at low altitude (2 – 3,000 ft) and using a variety of materials and construction methods. Two weeks ago I completed a week long test session in a remote part of Australia. The testing was plagued by difficulties culminating in a splice separating in the Spectra line (U.S. factory splice!). The kite was at about 7,000 ft and drifted for over 7 miles before the line snagged a tree. I managed to get the line secured to the winch and got the kite down to 1,000 ft or so then the line broke. The kite was lost for a week in thick bush. A few days later, I hit a kangaroo at 60 mph, damaging my car substantially. The kite and GPS was found a few days ago by the station (ranch) owner. Despite the hot weather, flies and the loss of 2 GPS units, I managed to fly several kites to 4,000 ft +. 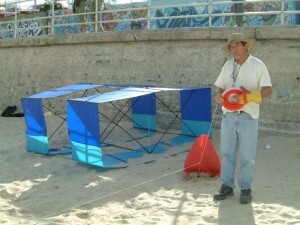 I have various small to medium deltas, Conyne Deltas and Hargraves Box kites ranging from 10 sq ft to 127 sq ft. The best performing kite for its size has been a winged box of 25 sq ft. The winch consists of an 18″ diameter reel driven through pulleys by an electric motor supplied by a 2 kW generator mounted on a box trailer. The line is 10,000 meters (33,000 ft) of 0.7 mm diameter, 200 lb Spectra. There is an onboard GPS unit which measures position within 1 metre and altitude within 10 metres. The data is downloaded into a laptop where its flight is displayed in tables and graphs. I will also have 2 theodolites and a surveyor to verify altitude. I have studied the atmospheric records for this site and come up with the best time of year to attempt the record. The air temperature has a significant influence on the air density and the lift the kite will generate. There is a sweet spot for all kites where the lift and drag are balanced at the highest angle. For this kite it is 15 knots but it has the widest wind range of any kite I have flown. The air density drops with altitude and is only about 50% of the ground level density at 18,000 ft. The wind needs to double its speed to have the same lift. Not only that, but the line drag is the biggest factor to overcome. The line weight will only be about 8 lb and this is not a problem for the kite to support. The profile of the line has an area of about 60 sq ft so this means substantial wind drag. And that brings you up to date – as of our last discussion of Bob’s project. But it’s been about four months now, and several things have happened that affect the project… all of them quite positive, I’m pleased to report. First off, Bob has re-applied for membership in the American Kitefliers Association, and subsequently notified the AKA’s newly constituted “Records Committee” of his proposed attempt to fly a single kite on a single line higher than anyone else ever has. If successful, the AKA will add Bob’s record to its records archives. I was a member 2003 – 4 but I let it lapse as there was no records committee then and most focus seemed to be on low altitude flying with a heavy emphasis on artistic designs and stunt kites. Of course, this is only a reflection of most members’ interests and my high altitude flying will only have a few devotees. I know people are interested in my activities but I guess I was looking to “pick the brains” of AKA members who I thought may have a lot of knowledge about high altitude flying. My wife thinks that, after spending 1000’s of hours (and dollars! ), I would have a good chance of obtaining a PhD in high altitude kites. I thought she was joking but she is serious! I’m not going to Sydney University to apply though as I may end up being locked up! Both the membership application and the notification of a Record Attempt have been accepted by the AKA, and Bob’s… On track! A few days ago, an Australian representative of Guinness contacted me as they are interested in covering my record attempt. He also told me that the review committee in England were examining Richard’s record since I pointed out they misquoted the record as 14,509 ft above ground level, not 13,609 ft above ground level as Richard had reported. The reference to “Richard” refers to Richard Synergy, the current Guinness record-holder, whose successful record near Kincardine, Ontario, Canada, dates from August 2000. In any case, Bob Moore is definitely involved with both AKA and the Guinness people at this point, and… On Track! In other developments, Mr. Moore has also received official permission from the Australian government for the record attempt. This may not seem too important to you, but governments take a dim view of kites flying up in the air where aircraft sometimes play… The folks “down under” have cleared Bob for the record attempt. We will be at the site from April 24th – April 30th. The Air Safety Authority has allocated a 40km diameter and 20,000 ft high zone. There are strict conditions I must adhere to such as no night flying, not flying in cloud and not flying in winds over 25 knot ground equivalent. The nearby weather station will play a vital role by providing wind data from ground to high altitude via daily balloon Radio Sonde flights. The kite is a 12 sq metre full cell Conyne Delta. It has a three legged bridal with elastic lower and centre legs. These will limit the pull generated and smooth out gusts. This kite easily flew to 7,500 + ft in the October testing before a splice separated at the 3,000 metres point. The altitude will be measured with onboard GPS and two theodolites spaced 1 km apart. The later will be rendered useless by cloudy conditions but with 27 years experience as a survey technician, Hugh can measure positional accuracy to within 1 metre. This is better than the manufactory’s claim for the GPS. It should take, at the most, 3 hours to reach the target altitude of 18,000 ft in ideal conditions. It may take about an hour longer to winch it back. If I am successful at reaching 14,500 ft I will apply to the Guinness Book and the newly established AKA records committee for recognition. I need to satisfy all their evidential criteria. After 2 years of research and preparation, I am quietly confident of breaking the record. So you can see that the plans are progressing, and Bob’s project is… On Track! But his major focus in the last couple of months hasn’t been all the official paperwork… He’s had a couple of real issues to deal with as well. As you already know, Bob lost his best kite early on… Lost it at what was estimated to be 7,500 feet! The kite was subsequently located and retrieved, but its loss brought up some serious questions. The loss occurred due to the failure of a factory-made splice in the 200lb Spectra flight-line. Well, Bob has about 9,500 metres of 200lb Spectra to use for his record attempt – and if one splice can fail, might another one fail next time? Bob has also expressed dissatisfaction with the way his electric flight winch has performed from time to time, and has been busy rebuilding it with an eye toward efficiency, smoothness, and hands-off operation. An update on the progress of the world single kite altitude record attempt. Accommodation is booked for Cobar, a remote part of NSW, Australia. I will be at Cable Downs, a 50,000 acre sheep station (ranch) 40 km northwest of the Cobar township. I will be flying from a disused airstrip. I’ve almost completed the modifications to the winch and have added a capstan, storage reel, an adjustable line tensioning clutch, and a line laying system. The whole device will be mounted on a steel post on a box trailer so it can swivel like a tank turret. The line payout is measured with a digital meter, triggered by a magnet on the capstan drum. Line retrieval is 4,600 metres/hour. The line is 9,500 metres of 200lb Spectra, a high density, braided Polyester fibre. This line is 0.8mm thick. As I had bad experiences at the October testing due to poor line splices, I have focused on line integrity and have checked the entire line 3 times. That is nearly 30,000 metres of line! 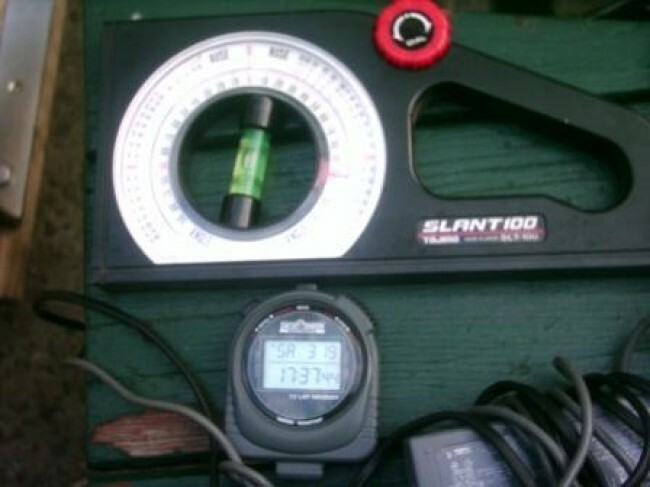 I also made a line testing rig and the Spectra measured between 195 – 210 lbs breaking strain. There will be “fusible link” near the bridle. This will consist of 160lb braided Dacron. If the kite encounters unexpected high winds, rather than breaking near the winch, the line will break near the kite. The kite will drift to ground quicker and eliminate the chance of the line dragging through the countryside, prolonging its flight or snagging a tree and flying outside the allocated zone. The line will also drop more quickly. Four other people will be assisting me in the attempt: Michael Richards, kite builder; Hugh Moore, surveyor; Greg Moore, mechanic and David Moore, photographer. As you can see, Bob has been working quite diligently to eliminate any possible “line” problems. Both the Spectra flight line and the winch have received special attention to reduce or eliminate as many problems as possible. His team is picked and ready. His site is chosen, reserved, and his attempt is “sanctioned” by the government. He’s been working to upgrade his flight gear to be equal to or exceed the task requirements. He’s even purchased a tiny transmitter to hook to the kite in the event of a kite break-away, and will have the receiver/antenna hook-up to track the kite if it occurs. And he’s got the attention of both the AKA and Guinness record committees. Now all Bob Moore really needs is some decent “wind luck” near Cobar in New South Whales, Australia at the end of April. He’ll be out there with his big Conyne Delta, a whole reel of 200lb Spectra flight line, a bunch of measuring equipment, and some folks to help him fly the kite and measure the kite’s altitude. Bob, our wishes go with you, friend. Go out there, get the job done, and bring back the required documentation. And keep us posted, won’t you? Kitelife will be anxious to hear how it all turns out. This entry was posted in 2005, Issue 41 (Mar/Apr), Kiting Experience, KL Archive and tagged altitude, Australia, World Record.